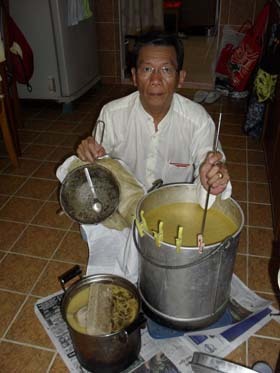 Master Sanna personally attends to all stages of the candle making process. Made of pure beeswax, each candle is hand made and infused with the high levels of spiritual healing energies. A specially prepared written material called a yantra is individually inserted into each candle. Each candle is infused and “charged” with the appropriate mantra during special phase of time and day. Light this candle in a room/office and the high level of spiritual energy released from the candle will cleanse any harmful negative energies and entities lingering about. This candle helps nullify any harmful elements around you. It can help anyone in overcoming traumatic events, stress and help restore the body’s energy to the balance state. Simply light the candle in the room/house and move around the entire site, especially the corners, to clear negative vibrational energies. Once lit, it must be allowed to burn out. Meditate and visualise your body absorbing the warmth from the candle lit in front of you till it burns out completely. It will clear the blocked energies in the physical, emotional, mental and spiritual realms, balancing all the chakras in the body while re-adjusting the body elements. At the same time, it can rid negative entities off from the body. Carry this candle with you while traveling and it will prevent you from danger caused by any negative entities. This candle is specially prepared to cleanse oneself of misfortune and curses. When moving to a new home, light the candle to remove any jinx lurking around left behind by the previous owner. Simply light the candle in the room/house and move around the entire site, especially the corners, to clear negative vibrational energies. Once lit, it must be allowed to burn out. Meditate and visualise your body absorbing the warmth from the candle lit in front of you till it burns out completely. It will clear misfortune and curses from the body. Lit the candle on the edge of a basin/pail of water. Allow the tear-wax to drip into the water until the candle burns completely. The water is then used to clean oneself from head to toe to rid one of all kinds of jinx (bad luck). For residential or office use, the water can be sprinkled around the house/office to cleanse any jinx lingering around. Lighted in the office or home, the candle will enhance the workplace and create a better environment to work in. It is also perfect for enterprises taking off to a good start. This candle will help you succeed and achieve recognition for your efforts in your career, meeting clients and in exams. It is recommended to use Item #C1 or Item #C2SGD30.00 to cleanse oneself before lighting this candle. Make a wish while holding the candle before lighting it. Meditate and visualise your wishes and desires for 10-15 minutes with the candle lighted in front of you. After which allow the candle to burn out. This candle brings about better atmosphere and mood. Light it in a meeting room and it creates a peaceful and smoothing atmosphere. This candle can be used to gain favor in the eyes of others. It is also capable of improving interpersonal relationships with family and friends. It is recommended that Item #C1 or Item #C2 is used first to cleanse oneself before lighting this candle. This powerful candle is specially used to chase stubborn negative entities away. Light it in the night to get rid of evil forces. It also protects and wards you against harmful spirits. When moving to a new home, light the candle to banish malevolent spirits and harmful vibrational energies left behind by the previous owner. Simply light the candle in the room/house and move around the entire site, especially the corners, to clear negative vibrational energies. Once lit, it must be allowed to burn out. Meditate and visualise your body absorbing the warmth from the candle lit in front of you till it burns out completely. It will break spells and banish negative entities in the body. This is a specially prepared powerful cleansing tool for moving of houses. When lighted, it rids the area of negative energies/entities that are strongly attached to objects affecting the Feng Shui of the house. This powerful advance space cleansing method will banish any negative energy/entities. Light a candle in each corner of the house/office and one candle in the center, till the candles are completely burnt. The size of candles of Item #1 to #6 are about 1 cm in diameter and 7 to 8 cm long. When lit, it can last about 45 minutes. It is recommended that Item #C1 or Item #C2 is used first to cleanse oneself before using other candles or amulets. *Prices are for the respective items only. Local and International postage/shipping rates apply. Note:All the items mentioned are not to be used for one’s selfish gains or to harm others. The mind must be just and the heart righteous. Use them as tools to help you create positive changes in your life and fulfill your desires. All items come with full instructions and advice. The amulets are specially tailored to each individual’s needs such as protection and building better relationships. They are made of a small piece of yantra, which is then rolled and inserted into a miniature glass tube filled with special oil. The tube is housed inside a specially designed metal/wooden casing and it can be worn as a pendant, just like a necklace. Two copper cylinders rolled and filled with yantras, about 4cm long each are tied to threads to be worn around the neck or put inside the pocket for protection against any dangers and accidents caused by negative entities. A wax paper rolled and filled with yantra of 7cm in length can be inserted in a pillow. It can ward off spells, curses and evil spirits. A mini-gold candle fill with yantra with a gold plated casing. It can protect against high-level negative spirit entities and general hex/charms/curses. It also enhances your career, studies and other aspect of your life. It is recommended that Healing Candle (Item #C1 or #C2) is used first to cleanse oneself before using the amulets. *Prices quoted above are for respective items only. Local and International shipping /postage rates apply. Note: All the items mentioned are not to be used for one’s selfish gains or to harm others. The mind must be just and the heart righteous. Use them as tools to help you create positive changes in your life and fulfill your desires. All items come with full instructions and advice. The word ‘Ghosts’ may send shivers down your spine. But what do we really understand by the term? 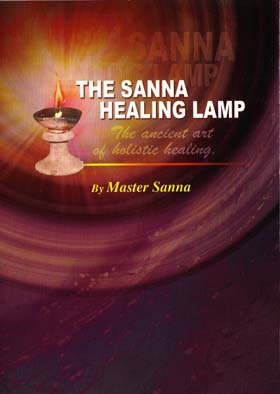 The Sanna Healing Lamp helps to heal people who have experienced such encounters. In this book, they share their experience of the Sanna Healing Process…. Holistic House. Curious to know what ancient healing arts are and what the Sanna Healing Lamp can do? The answers lie within these pages…. The book will also bring you a greater depth of understanding of such topics as Luck, Feng Shui, Metaphysics, and the importance of Meditation, amongst others.